We’ve been waiting to see what ::vtol:: (a.k.a. Dmitry Morozov) would come up with the next! 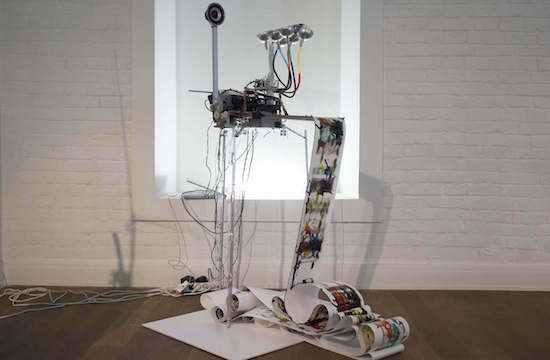 The Moscow-based hacker artist has now created an electro-mechanical drawing machine. The Electropollock, which pays homage to influential American painter Jackson Pollock, is driven by the sound of music. A special algorithm analyzes the tunes and then controls the electric valves, servo motors with brushes, and the special fan intended for spray painting. The intensity of ink supply, the rate of the moving paper, and the activity of the brushes all depend on the frequency and amplitude of the peaks in the music. The machine features an old printer mechanism, an Arduino Uno, and is programmed using Pure Data. You can see how it works in the video below!